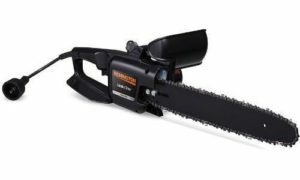 Is An Electric Chainsaw Worth the Money? 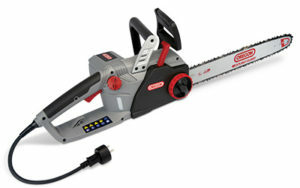 An electric chainsaw has a multitude of benefits over a gas-powered device. They are much better for the environment due to the lack of harmful fumes. They are also much more affordable, since the actual devices themselves require less expensive components, less maintenance, and you don’t need to buy gas! However, you do still need to oil them. They are lightweight and quiet, making them much more user friendly. You also don’t have to worry about the annoyance of starting them – you just plug it in and pull the trigger! They’re no replacement for someone in forestry who will be deep in the woods, but they’re great for smaller jobs around the house and woodworkers. However, they do have their own set of setbacks. 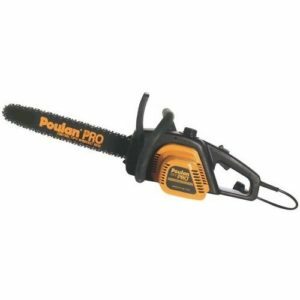 You won’t be able to get quite the same amount of power than a gas powered unit, so even with the best electric chainsaw, most professionals will opt for a larger gas-powered one. That being said, the electric units can still crank out power and you can slice through even thick trunks. As well, although you do save on gas and avoid fumes, you will need to use an extension cord to reach whatever job you’re working on if you’re using a corded model – another reason the pros stick with gas. Otherwise, you’ll need to get an electric generator. Battery operated chainsaws avoid the cord issue, but the battery life isn’t always the greatest for larger jobs, and you may lose power as the battery drains. Overall, they are great for what most folks need them for: small to moderate sized jobs within 100-150ft of your property(unless you plan on using a generator which kind of defeats the purpose) and for woodworkers. They provide a surprising amount of power, and likely won’t even notice that it’s powered by electricity. 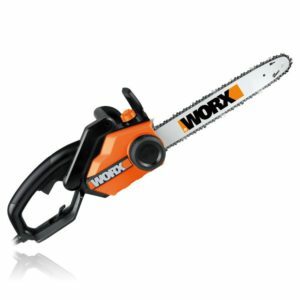 So now that you understand the benefits and pitfalls of an electric chainsaw, you know what to expect when buying one. What is the Best Electric Chainsaw? There’s so much misinformation out there on the internet today, it can be difficult to decide. Our team got together and researched and reviewed over a dozen different models of electric chainsaws and narrowed it down to this short list of the 5 best for you to decide from. Let’s dive in! Recommendation: Not quite the same power as gas, but can handle big jobs. Little bit on the heavy side. Recommendation: Powerful while still maintaining a light weight. Great for bigger jobs. 18″ long bar can be a bit annoying to maneuver for more detailed jobs. Recommendation: Powerful and affordable with a great warranty. Great for the occasional user. Recommendation: A heavy-duty saw with industry-level power from an electric motor. May be too heavy for some. 18″ bar is great for larger logs greater than 20″ but can be more difficult to maneuver for smaller jobs like de-limbing.